Today I have the pleasure of having Lauren over to share her post on Gift Ideas. Gift giving is an important part of tradition. This expression of caring transcends all cultures, ages and seasons. It is inherent in all of us and is natural, to want to show appreciation and love for those who mean the most to us. 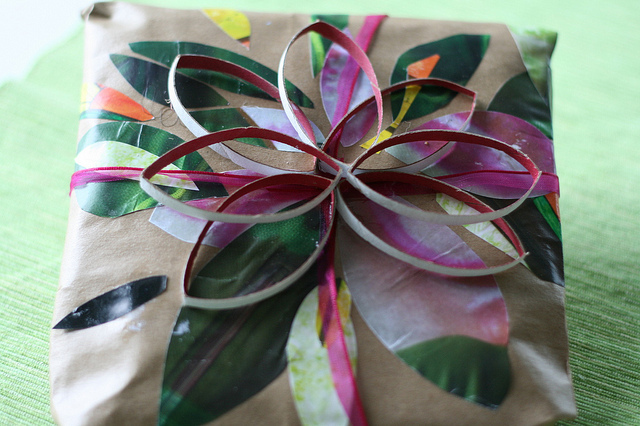 Here are a few tips to enhance your gift giving. Not necessarily the easiest to come up with but handmade gifts are timeless and sometimes mean more than store bought gifts. At a young age, we learn to give of ourselves with homemade gifts. These ranged from small note cards for our parents, necklaces fashioned from noodles or even simple drawings that were proudly displayed on the refrigerator. As we grow older, we find more creative ways to make presents. One very moving type of gift is a scrapbook that is customized, by decorating to the style of the person that it is given to. Even when buying presents from a store, we can give these gifts an extra personal touch. Whether buying picture frames, clothes, or stuffed toys like a mini bear, there are ways to make them special. The common picture frame can get a facelift by choosing a wonderful photo with a little design twist. Any present can be made more interesting by creating something personalized, like small notes or adding secret messages inside. Gifts are not only something that you buy. A gift can be; helping out a friend with a project or even as simple helping them to pick out a new dress. It could also be volunteering for a good cause or just being company on a hike. Cooking up something delicious, such as baked goods, is also a wonderful way to bring a bit of joy to someone’s day. Make it Look Good and Dress It Up! Lastly, don’t forget the wrapping paper. Presentation is always important and adds value to the gift giving. A simple gift card folded into an origami Crane is a delightful surprise. This instantly upgrades your gift into a more though-out gesture that shows meticulous care and preparation. An added touch that expresses how much you know about the person goes a long way. Why not put a ribbon around a graduation bear for your nephew or add some sprinkles to your baked goods for Grandma? No matter what the occasion or the event, hopefully these gift ideas will help you to make it special. By Lauren Wainwright, a blogger working in a team of writers on a variety of topics. Follow her on Twitter! Would you like to be my next guest-blogger?